APC Smart-UPS® protects your data by supplying reliable, network-grade power in either traditional Tower or Rack-optimized form factors for space constrained business critical applications. Award winning APC Smart-UPS® is the perfect UPS for protecting business critical fileservers (Intel or UNIX based), minicomputers, network switches and hubs, Point of Sale, retail/bank back office and ATM’s. Rack Mount versions are the choice for rack optimized servers, server appliances, blade servers, other blade devices and rack-mounted network switches and hubs. 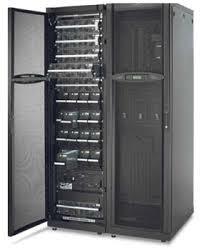 InfraStruXure™ fully integrates power, cooling, and environmental management within a rack-optimized design. The InfraStruXure™ on-line BuildOut Tool automates the process of designing the optimum system. These customized systems are then built from standardized components which are modular, manageable, and pre-engineered to work together.